This novel is now available to purchase on Amazon and Amazon UK. BradyGames have announced that a brand new Tomb Raider novel will be coming our way later this year. 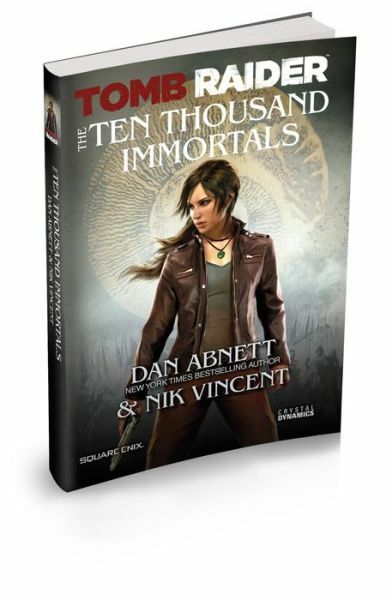 Written by the bestselling author and comic book writer Dan Abnett and his partner Nik Vincent, Tomb Raider: The Ten Thousand Immortals will continue and build upon the events of Tomb Raider 2013 and, like the ongoing comic series, will become canon within Crystal Dynamics’ reboot timeline. “Haunted by what she was forced to do in order to survive her first adventure, Lara Croft wants only to put her horrifying ordeal on Yamatai island in the past. Her modest wish shatters as she’s plunged into a frantic race to save her best friend Sam from a toxic overdose. Desperate for a remedy, Lara searches for anything that could help Sam. A wisp of hope arising from a myth gives Lara purpose: the story of an ancient and mysterious artifact that could heal her dying friend, and possibly help explain the supernatural events she witnessed on Yamatai. So it looks like Lara will be dealing once more with shady characters, secret societies, and her friend’s blatant inability to stay out of trouble. The titular “Ten Thousand Immortals” calls to mind the elite soldiers of the Persian Empire who fought against the Spartans and other Greeks at Thermopylae, an event that was immortalized in Herodotus’ The Histories and liberally reimagined in the Frank Miller comic series, 300, and its 2007 film adaptation. Although there is little indication from the novel’s synopsis that the “Immortals” referred to in the title are of ancient Persian origin, it’s worth noting that Herodotus gets a mention in the 5th issue of Dark Horse’s ongoing Tomb Raider comic series and that, while trying to rescue Sam for the hundredth time, Lara tries to remember the details of a Persian prophecy, which is first touched upon in the 1st issue. Could this be pure coincidence or will the comic series and novel tie into one another in the lead-up to the release of Rise of the Tomb Raider next year? Does the story in the novel take place before or after the story arc explored in the first 6 issues of the comic series? Only time will tell what new adventure Lara will be embarking on in The Ten Thousand Immortals and how it will fit into the rebooted timeline. UPDATE: Crystal Dynamics have confirmed that the novel will take place directly after the game and before the events of the Dark Horse comic series. Absolutely cannot freaking wait for this novel. I’ve always hoped the reboot Tomb Raider will be adapted into novels. Sam needs to go away. Sam has the uncanny knack for getting herself into some sticky situations. Lara should send her off for some SAS survival training for her own good!